To tell you the truth I never really eat chicken. I’m super persnickety about where it comes from and apart from the occasional roast bird or late night chicken wings (gross, I know – the cocktails cloud my good judgment) I really never partake. But every once in awhile the kid in me yearns for a chicken sandwich just like my high school’s dining hall used to make – simple. crunchy. buttery. So here it is – perhaps even a slightly healthier version than the lunch ladies made – since it’s baked not fried. The sandwich may not be gourmet, but it sure is satisfying. Preheat the oven to 400 degrees. Line a baking sheet with foil, lightly oil and set aside. In a medium sized bowl join the ¾ cup of mayo, milk and a good amount of S&P – whisk to combine. In another medium sized bowl whisk together the panko, parmesan and spices (season the mixture well with S&P!). 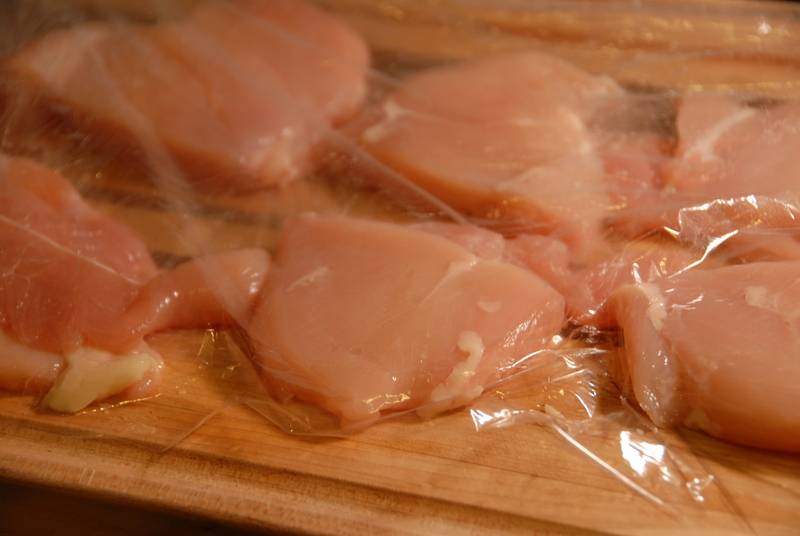 In between 2 sheets of plastic wrap gently pound the breasts to flatten to a uniform thickness using a mallet or a frying pan. 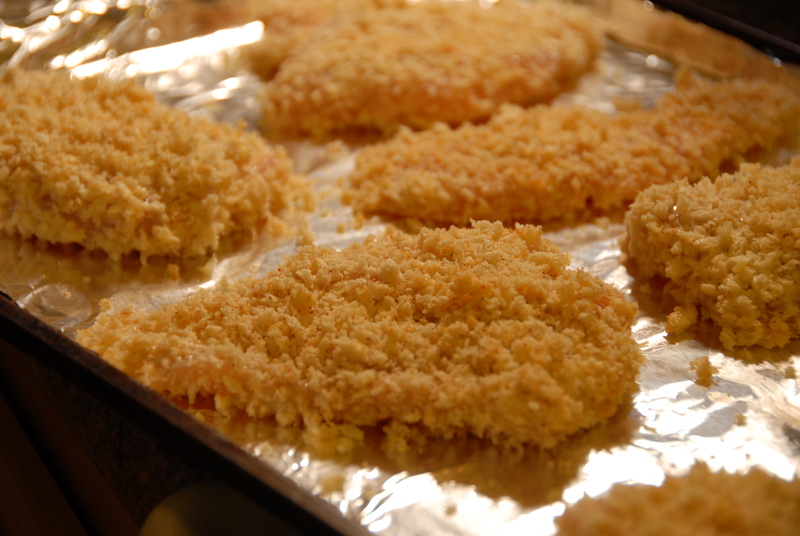 Dunk the chicken breasts in the milk/mayo mixture followed by the panko mixture – making sure to thoroughly cover the meat. Press the panko mixture into the chicken just to be sure it’s really stuck on there. Place on the prepared baking sheet and bake until cooked through – about 30 minutes. 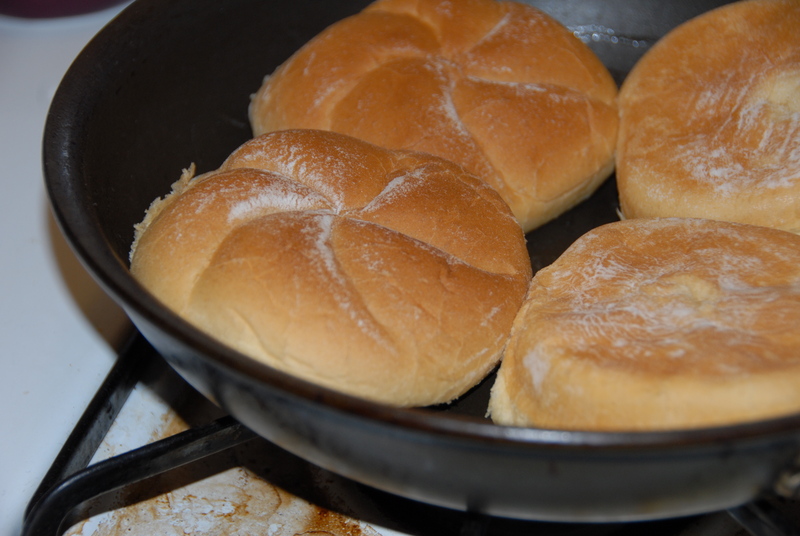 Meanwhile butter the potato buns and heat them in a non stick pan. And then build the ultimate sandwich: buttered bun, iceberg lettuce, hot sauce, pickles, a touch more mayo and a chicken cutlet – get ready to take a walk down memory lane. 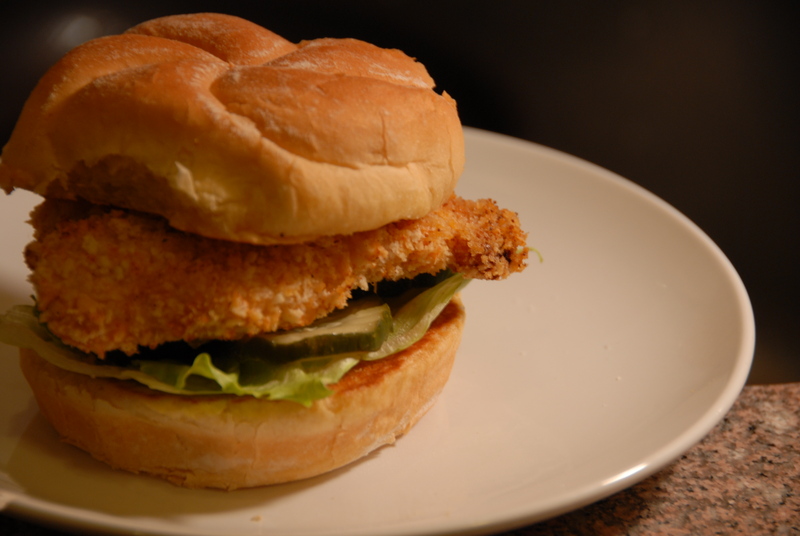 This entry was posted in Chicken and tagged breaded, butter, chicken, lettuce, mayo, panko, paprika, pickle, sandwich. Bookmark the permalink.